Asthma is a heterogeneous disease characterized by chronic airway inflammation. It is defined by a history of respiratory symptoms that vary over time and in intensity, together with variable expiratory airflow limitation. [i] Although a majority of patients can achieve good asthma control with the use of inhaled corticosteroid (ICS) and bronchodilators, some patients’ asthma remain uncontrolled despite the use of these medications. Severe or uncontrolled asthma is estimated to be present in 3–10 percent of the asthma population,[ii] and imposes a substantial cost on healthcare services. [iii] In the Global Initiative for Asthma (GINA) 2018 guideline, severe asthma is defined as asthma that requires Step 4 or 5 treatment (eg, combination therapy with high-dose ICS and long-acting β2-agonist [LABA]) to prevent the condition from becoming uncontrolled, or asthma that remains uncontrolled despite this treatment.1 The European Respiratory Society/American Thoracic Society (ERS/ATS) Task Force on Severe Asthma considered that the definition of severe asthma should be reserved for patients with refractory asthma and those in whom the response to treatment of comorbidities is incomplete. [iv] Clinical features of severe or difficult-to-treat asthma include frequent or persistent asthma symptoms, frequent exacerbations, persistent loss of lung function, substantial impairment of quality of life, and troublesome comorbidities such as anxiety and depression. In this article, we present the case of an elderly patient with severe asthma that remained uncontrolled despite maximum doses of ICS, bronchodilators and montelukast. The patient finally achieved asthma control with the use of an anti-immunoglobulin E (anti-IgE) therapy. An 80-year-old lady, who had a history of hypertension, multinodular goitre and chronic hepatitis B, presented with shortness of breath and wheezing since 2013. Her symptoms were relieved by oral prednisolone and inhaled salbutamol. Her lung function test showed significant reversibility with a forced expiratory volume in 1 second (FEV1) increase of 270 mL (33 percent) after bronchodilator use and an obstructive pattern with an FEV1/forced vital capacity (FVC) ratio of 44 percent. A diagnosis of asthma was made, and the patient was put on fluticasone/salmeterol (125/25 µg) and as-needed inhaled salbutamol. The patient experienced multiple severe exacerbations requiring hospital admissions despite optimization of drug compliance and inhaler techniques. In September 2014, she was admitted to the intensive care unit (ICU) and required mechanical ventilation. Her medications were stepped up to fluticasone/salmeterol (250/25 µg), tiotropium, montelukast and theophylline. She achieved a short period of stable asthma control but subsequently experienced multiple attacks requiring ICU admissions and use of noninvasive ventilation. 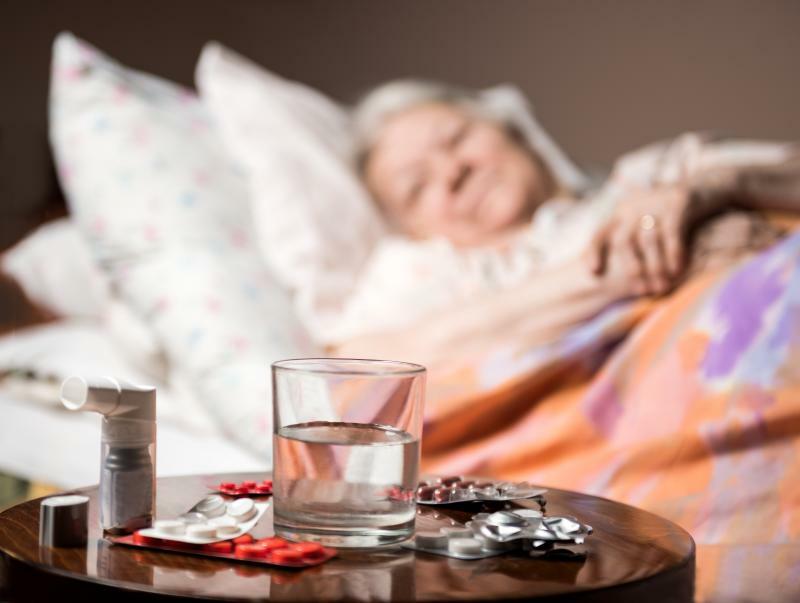 Other comorbidities, including gastro-oesophageal reflux disease (GERD) and obstructive sleep apnea (OSA), were ruled out. CT of the thorax also showed no evidence of other pulmonary diseases such as interstitial lung disease or bronchiectasis. All autoimmune markers were negative and blood eosinophil level was not elevated. Due to frequent asthma attacks, the patient required repeated courses of oral prednisolone. After discussion with the patient and her family, it was agreed that a trial of self-financed omalizumab, a monoclonal antibody against IgE administered subcutaneously, would be initiated. The patient’s pretreatment IgE level was 98 IU/mL and her body weight was 54 kg. She was thus started on omalizumab 150 mg injection every 4 weeks, and became free from hospital admissions since then. Tiotropium is a long-acting muscarinic antagonist (LAMA) first used in the treatment of chronic obstructive pulmonary disease (COPD). In patients with severe asthma, tiotropium in combination with ICS and LABA was found to improve lung function, reduce the risk of asthma exacerbations and progression, and improve symptom control. [v] Tiotropium is the only LAMA currently included in the treatment algorithm of asthma. If the disease is still suboptimally controlled despite the use of tiotropium plus ICS and LABA, further phenotyping of the type of inflammation would be needed to guide subsequent treatment. 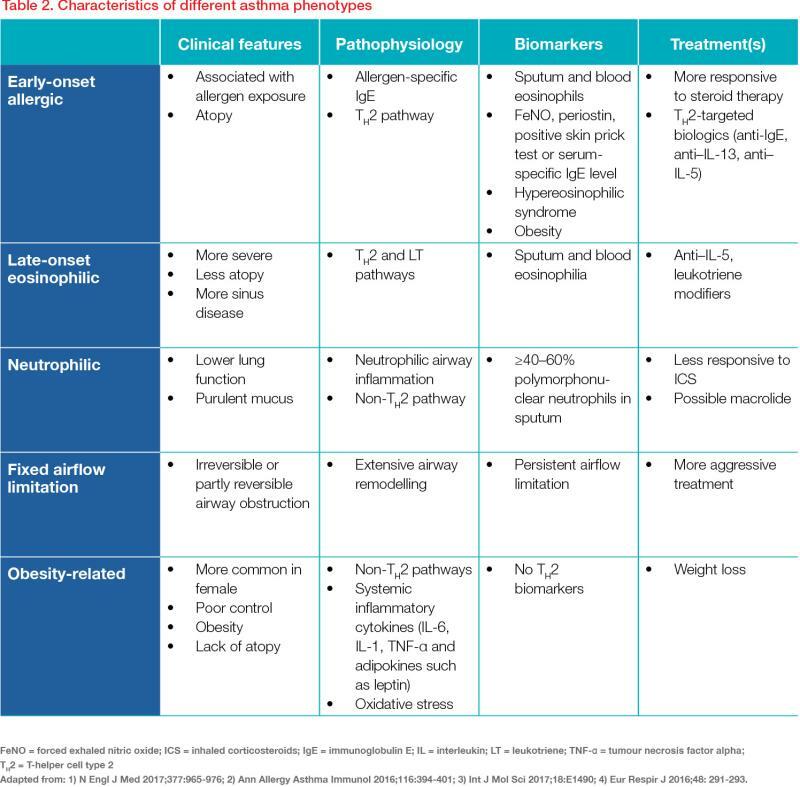 The underlying inflammatory pathways and corresponding treatment options are shown in Table 2.1,2,[vi] Currently, serum IgE level and blood or sputum eosinophil counts are the most commonly used biomarkers to guide the selection of novel treatment options in clinical practice and clinical trials. Omalizumab is the first biologic approved for use in asthma treatment. It is a monoclonal antibody against IgE and can reduce the levels of free IgE in blood. The dose of omalizumab depends on the patient’s body weight and pretreatment IgE level. Major side effects of omalizumab are injection site reactions and anaphylaxis (rate, 0.09 percent). After the first three injections of omalizumab, close monitoring of the patient for 2 hours is required. In clinical trials, omalizumab significantly reduced rates of severe asthma exacerbations and emergency department visits. It also significantly improved patients’ quality of life, morning peak expiratory flow and asthma symptom scores. [vii] In a meta-analysis, omalizumab was associated with reduced asthma exacerbations and hospitalizations. [viii] The biologic can be used in patients with serum IgE levels of 30–700 IU/mL and body weight of less than 150 kg. Post-treatment monitoring of IgE levels is not useful. With advances in technology, other biologic therapies are also in the pipeline for clinical trials as potential treatment options for patients with severe asthma. [xiii] Although promising, these biologic agents are associated with significant costs. These agents should therefore be used only in patients whose asthma remains uncontrolled despite treatment with optimal doses of ICS/LABA and other drugs, with comorbidities being managed as far as possible. Besides monoclonal antibodies, bronchial thermoplasty is another treatment approved by the US FDA in 2010 for asthma treatment. The mechanism is to deliver controlled radiofrequency energy to the airway walls to reduce excessive airway smooth muscle and limit airway constriction and hence, asthma exacerbations. As the treatment requires three separate sessions of bronchoscopy, there is a risk of asthma exacerbation during the treatment and in the early post-treatment period. Bronchial thermoplasty can improve peak expiratory flow and asthma symptoms and reduce severe exacerbations. Longer-term data currently available showed that the effects were sustained after 5 years. [xiv] With a better understanding of the disease and advances in molecular technology, more new treatments are emerging. Bringing severe or uncontrolled asthma under control will no longer be an unreachable target in the near future.